The Middle Ages followed the collapse of the Roman Empire, roughly lasting from the 5th to the 15th century, overlapped by the Renaissance in its last years. 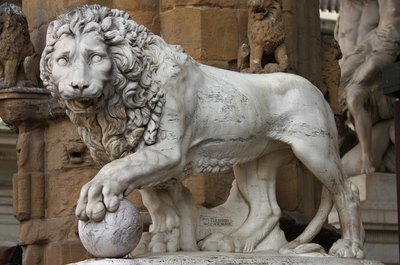 The Renaissance began in Italy during the 14th century and continued through the 16th century as it spread to England, France and what is now Germany. Since Renaissance means rebirth in French, as it spread across Europe, it came to represent a renewed interest in Humanism, classical studies and cultural advancements; it changed architecture, the arts and literature. Medieval painting was characterized by a lack of perspective, in which the size of human figures was not determined by their position in the picture but by other factors, such as their social status. Humans and their environment were presented unrealistically in two dimensions. But during the early Renaissance, painters like Masaccio of Florence began using perspective to create an illusion of depth and bring focus to important figures or objects. This resulted in the creation of accurately rendered and anatomically correct human figures, highlighting the Renaissance embrace of the ideal human body. During the Middle Ages, sculptors carved human figures primarily as components of larger architectural works but Renaissance sculpting changed that. For example, the gate of Canterbury Cathedral in England constructed at the beginning of the English Renaissance, displays Christ seated in judgment. Seeming to emerge from the walls behind him, the figure of Christ is part of the environment as with other medieval sculptures, but also breaks free from it, becoming a work of art in his own right. In this way, the sculpture foreshadows the Renaissance's shift to making standalone human sculptures. Donatello and other great sculptors furthered this development by carving lone statues free of any context, fully concentrating their art on the glory of the human figure. Late medieval architecture was dominated by the towering spires of Gothic architecture, austerely pointing towards heaven. The best-known architectural works of the High Middle Ages were cathedrals. These huge buildings, which might take a century to build and require the labor of a whole community, were characterized by vast spaces and dramatic lighting that seemed to suggest heaven. 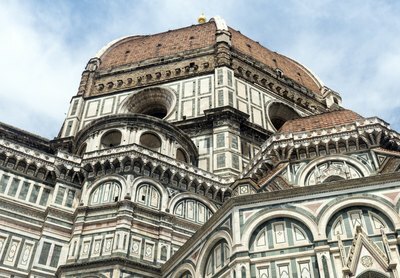 But during the Renaissance, designers such as Filippo Brunelleschi incorporated classical Grecian and Roman principles into Renaissance architecture. Characterized by mathematical proportions, perspective and classical rationality, these buildings, built a human scale of measurement, suggested a world of order and reason. Polyphonic plain chant -- the Gregorian chant -- was the dominant style in sacred music during the late Middle Ages. A simple singing style in which a chorus of voices all sang the same words in unison, this changed during the Renaissance. Composers began introducing new techniques such as imitative polyphony, in which half of a choir might sing one melody while the other half of the choir sang a different melody, like in the 19th century song, "Row, Row, Row Your Boat." 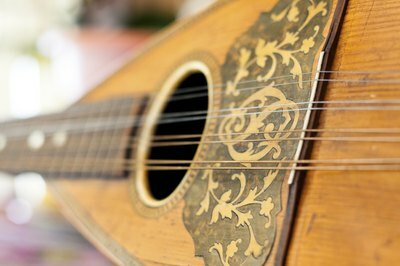 At the same time, the invention of new musical instruments -- like the lute -- led to the emergence of madrigals, short poems set to music that anticipated the pop music of today. 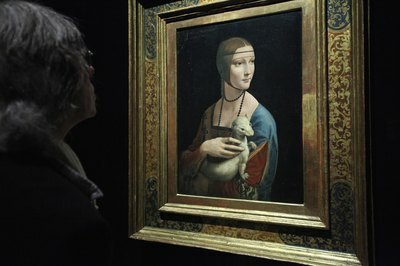 What Are the Similarities Between Gothic & Renaissance Art? Design Elements in the "School of Athens"